Nick Mason launches the ‘world’s most exclusive motoring book’. As the owner of two iconic Maserati racing cars and a knowledgeable and passionate marque enthusiast, who better than Pink Floyd legend Nick Mason to celebrate the launch of the world’s most exclusive motoring book the museum-quality Archive Edition of Nigel Trow’s award-winning history Maserati, the Family Silver? Hailing Maserati, the Family Silver as ‘a master work from a master historian’ Nick went on to describe Maserati as ‘a marque which embodies the ideals of passion and performance in a way that only the Italians have mastered. Whilst countless books have chronicled the deeds of its near neighbour Ferrari, up to now Maserati has been poorly served by the publishing world so I was delighted when Chris Mann told me of his ambitious plans to redress this glaring imbalance and produce a major history of the marque. 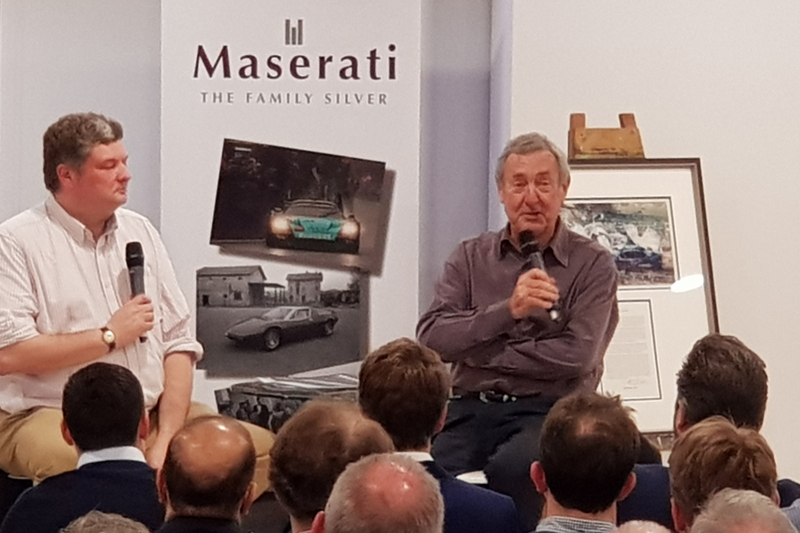 Pink Floyd legend Nick Mason Speaking at the Maserati, the Family Silver book launch. Speaking at Maranello’s historic Tower Garage at an exclusive launch event for the Archive Edition Maserati, the Family Silver which was attended by some 200 VIP guests including author Nigel Trow and artist Dexter Brown, Nick shared recollections from his stellar music career and his passion for Maserati. 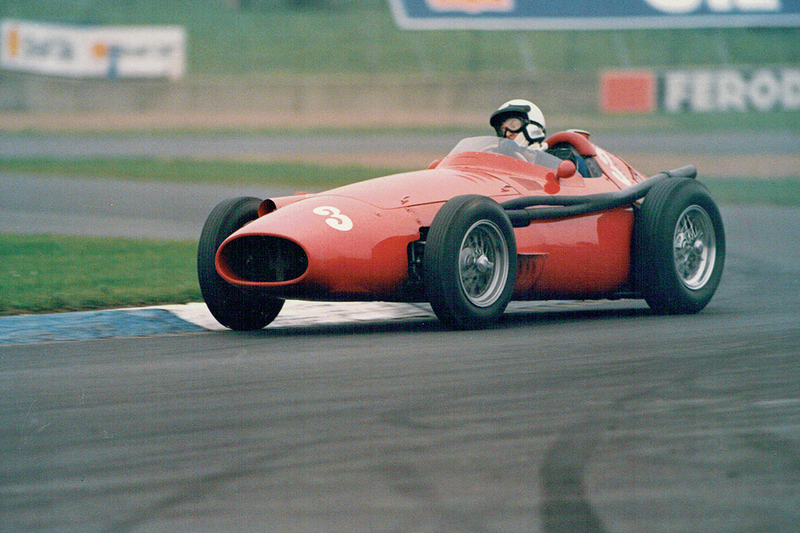 Asked if he has a favourite car, Nick said that this would be like asking to name a favourite child but recalled the occasion when his Type 61 Birdcage Maserati gave him what he described as the race of his career. ’In front of a packed crowd at the 1993 Grand Prix meeting at Silverstone, I managed to steal first place in the historic sports car race from a couple of D Type Jaguars on the last corner of the final lap. A moment like that is guaranteed to endear you to a car for life’. 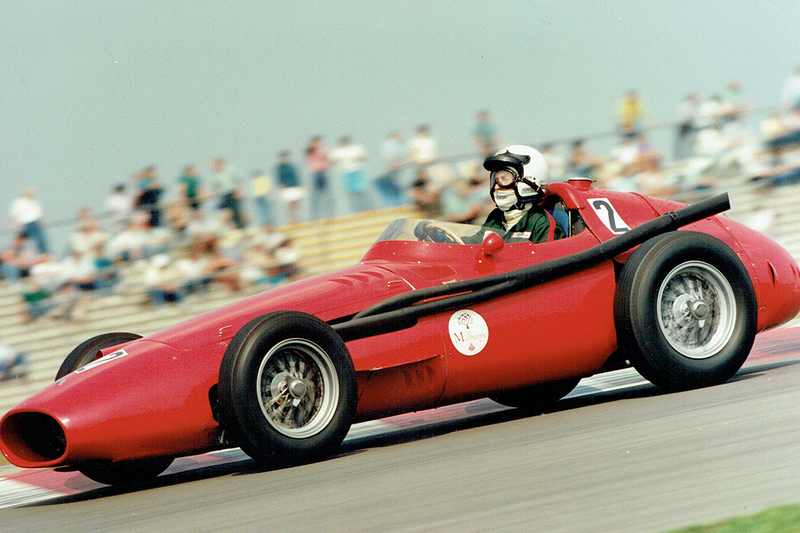 Pink Floyd legend Nick Mason competing in his Maserati 250F Grand Prix car. It was an earlier Maserati though, the Type 26 of the mid-1920’s, that first established the enduring legend of the Trident. Publisher Chris Mann explained that, in recognition of this remarkable machine ‘just twenty-six numbered copies of the Archive edition will ever be produced, no two of which will be the same’. Hand bound in fine leather and linen each volume has a hallmarked solid silver plaque inset into its front cover. The books are presented in a bespoke leather ‘tool case’ with an individually numbered identification plate. The package includes a vellum presentation page signed by Nick Mason, along with race legends Sir Stirling Moss and the late John Surtees, both of whom won World Championship GP’s in Maserati powered cars. Each of the individually numbered Archive Editions also comes with a separately framed original colour painting. These have been specially commissioned for the Archive Edition from such renowned automotive artists as Michael Turner and Dexter Brown. The package also includes a signed, one-off artist’s proof giclee print of the original, displayed in a demountable frame contained within the ‘tool case’.